We have discussed automated email templates in Chapter 3 of this guide. We also went over the various types of automated email templates such as autoresponders, content upgrades, support emails, and feedback emails. Now that you know more about automated email templates, the next question that comes is - How do we access these templates? These templates are often part of an automated email marketing platform. You might find some vendors who sell these templates (or provide free copies of them) without the accompanying software. However, to use these templates, you will still need to upload them to an email automation software. Such platforms and tools are paid services that let you send out mass emails anytime from any place on Earth. This provides great convenience to marketers. It frees you up from having to spend all your time and energy in front of the computer, frantically typing emails. With an email automation software, you can instead focus on other facets of your business. By using email personalization like we discussed in Chapter 4, you can nurture your leads in an automated setup without losing the "human element". If you’re a startup or small business, you don’t always necessarily have a lot of funds to go around. You want to be sure of every investment; any money you spend must be a wise investment. In this chapter, we will review several popular automated email marketing platforms. We’ll also share some options that are more affordable for startups and small businesses. Let's dive right into the tools and platforms that will get you the best results with your automated email marketing campaigns. For each of these tools below, we have also shared the price of their plans and links to the company’s website. This will help you compare and contrast these tools by your own, as you try to find the best option for your company’s needs. MailChimp is arguably the most well-known automated email marketing platform. Although it began as an automated email service, today MailChimp has grown to specialize in almost all things automation. You can create Instagram and Facebook ad campaigns, landing pages, and customized signup forms. You can also conduct A/B tests, optimize your site for mobile use, segment your audience, reach out to abandoned cart users, and review your marketing efforts with analytics. One of the reasons MailChimp is so popular is because of its Forever Free plan. You never have to pay, but you get only the most basic services. For instance, each month, you can only reach out to a maximum of 2,000 contacts and send a total of up to 12,000 emails. Email support and live chat from MailChimp is limited to 30 days. You don’t get custom branding or most segmenting and targeting features. With MailChimp's "Grow" Business plan, you pay $10 per month. The biggest benefit of this plan is that you can store unlimited contacts and send unlimited emails. You get more features than the free plan. However, you do not get pro support, comparative analytics reports, and multivariate A/B testing. There's also a "Pro" plan that gives all the basic plan features and other missing features at $199 per month. In this plan, you get all the features MailChimp has to offer - unlimited premium support, popup builders, landing page designers, email campaign managers, Instagram and Facebook ads, Google remarketing ads, marketing automation, A/B testing, and analytics. Another automated email marketing service that comes up a lot is Constant Contact. Unlike several other tools on this list, Constant Contact specializes exclusively in email automation. It has templates you can use to arrange and customize your emails your way. You can integrate your emails with your social media profiles. Constant Contact even recommends images and captions to use for more visibility and better engagement on social media. With tracking tools, you can determine the success of your social media and email campaigns with metrics like view counts, click rates, open rates, and more. If you already have your contacts in Outlook, Gmail, or Excel, you can upload and track your contacts with Constant Contact. Their system manages inactive emails, bounced emails, unsubscribers, and new subscribers so you don’t have to. It also offers targeted emails, email series, and email personalization according to a lead's anniversary, birthday, or opt-in date. You can start with their 60-day free trial. There are discounts available for small businesses stretching their every dollar. When you do pay, there are two plans to choose from: Email and Email Plus. Here’s a breakdown of the pricing for each plan. For the "Email" plan, first 500 contacts will cost you $20 per month. As your list grows, you will pay $65 per month until you reach 5,000 contacts. If you can spare $95 per month, Constant Contact provides up to 10,000 contacts. For the "Email Plus" plan, which includes all the basic and advanced services, you will pay $45 per month for an email list of 500 contacts or less. If your budget is under $100 per month, Constant Contact provides the "Email Plus" plan services at $95 per month for up to 5,000 contacts. For email marketing and other marketing automation features, you might consider ActiveCampaign. This company offers A/B testing, dynamic content, subscription forms, email segmentation, sales and CRM solutions, and messaging services. For your email marketing campaigns, ActiveCampaign lets you personalize all fields in your emails and use tags for greater personalization. You can also include conditional content that varies by audience segment and campaign. There are many email templates to choose from with drag-and-drop customization options. The templates are optimized for mobile use so you don’t have to worry about losing your traffic from mobile platforms. Email scheduling, automated workflows, drip campaigns for new contacts, date-based email campaigns, autoresponders, and one-time email capabilities are the rest of the services from ActiveCampaign. There’s also A/B testing and analytics built into the services for tracking lead engagement and conversions. It’s recommended you choose a plan based on the number of contacts you have. The Lite package is $17 each month for only three users in your company. You do get unlimited email sending, which is generous. For $49 each month, you can add 25 total users and get SMS marketing, a custom domain with custom branding, deep data integrations, lead scoring, and more. For $129 each month, it supports 50 company users and offers additional services such as attribution, site messaging, and unlimited email sending. ConvertKit is another choice if you just want to focus on automated email marketing. This platform lets you track your subscriber list by segments, handily organizing all subscribers with tags. If you decide to send regular newsletters or even single emails, you can use their "Broadcasts" features to choose exactly what content to send and when to send it. If you want to be more hands-on, there’s the drag-and-drop sequences builder. You can also use automated workflows to apply simple “if this, then that” rules. There are customized opt-in forms to give your subscription box a personal touch. Like the rest of the tools on this list so far, ConvertKit offers reporting via a homepage dashboard. Here, you can review opt-in conversions and other valuable metrics. You can choose monthly or yearly billing plans. If you have 1,000 or fewer subscribers, the $29 plan is right for you. If you have up to 3,000 subscribers, expect to pay $49 each month. For up to 5,000 subscribers you will pay $79 per month. Customized plans start if your list grows beyond 5,000 subscribers. All plans have unlimited email sends, unlimited customizable forms, reporting, subscriber tagging, and visual automations. You also get live chat and email support as well as integrations with more than 70 tools, apps, and programs. 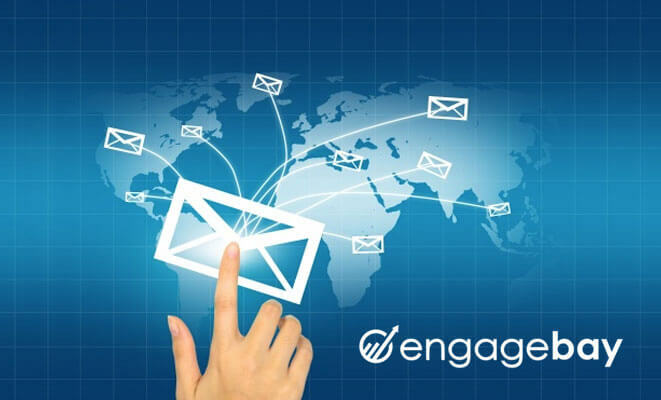 Of course, we couldn’t talk about automated email marketing and other marketing automation without mentioning EngageBay. Our all-in-one marketing suite has many preset templates for sending quick emails to leads and customers. You can even customize your email templates to address specific segments of your audience. EngageBay’s fluid email builder is a state-of-the-art email design tool, that goes beyond the traditional drag-and-drop creation process for email templates. With other email builders, you can customize templates by creating sections, by adding new components individually. This takes time and effort; it makes email creation a chore. EngageBay has templates for individual sections, so that you can add new sections just with one click. All templates are modifiable. 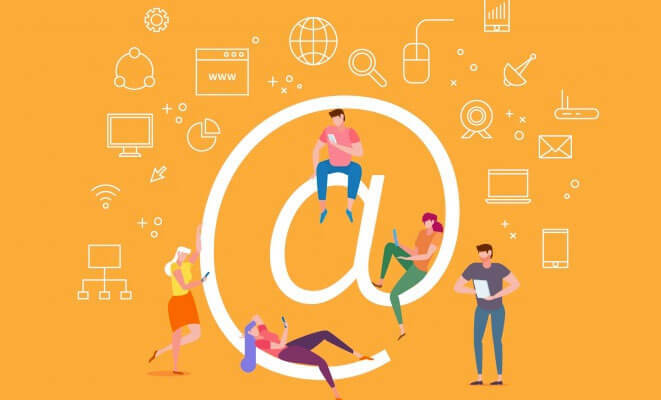 With EngageBay's individual section templates, you can go beyond the basic ways of email construction and truly start designing your emails. Our email builder also has social sharing buttons, images, visual design elements, and a text editor. With audience filters, you can effortlessly find the portion of your audience you’re trying to reach. You can also review the success of your automated email marketing campaign with built-in analytics and important email metrics. There’s more than email marketing with EngageBay. The service also includes a content management system, account-based marketing (ABM) campaign capabilities, event tracking and data syncing automation, a landing page builder, a customizable web form designer, social media engagement tools, and CRM software. EngageBay even integrates with Zapier to maintain the backward compatibility. Recently, our Sales and CRM Bay moved out of Beta. It provides all deal management and lead information tools in one place. Because the Sales team is accessing the same data as the Marketing team, the teams will always be aligned with each other. The 360-degree customer view screen lets you see every interaction your team has had with the customer - all on a single screen in a nifty "timeline" format. EngageBay strives to be an affordable alternative to expensive software, like HubSpot. That’s why our plans begin at just less than $10 per month. Most features are available at less than $3 per day. That’s a price that even startups and small businesses can manage. There are yearly plans also available which reduce the pricing even further. Our most expensive plan is less than $200 / month (when paid yearly). When it comes to automated email marketing, many busy business owners and marketers like yourself trust tools and software to do the job for them. It’s a good idea to invest in at least one email automation tool, whether you choose well-known names like MailChimp or smaller but up-and-coming services like EngageBay. For the money you’ll spend, you can make it back with successful campaigns and indirect growth - the time you’ll get back is priceless!